Purple Power, a cannabis strain with Sativa-dominant genetics, is a result of a cross between Dutch Dope and Skunk #1, two marijuana strains that are very well regarded in the cannabis community. Borrowing the best traits from both of its parent strains, it flowers early, is very easy to grow, and yes, it’s both purple in color and powerful. The only trick this gorgeous-looking strain has up its sleeve is that it’s a strain that is only worth growing outdoors or in a greenhouse, as it can behave extremely unpredictable when grown indoors. Purple Power plants look exactly as Sativas should look – they are tall, with thin, narrow leaves and long internodes, and that Christmas tree look Sativas can have, with plenty of lateral branches that will eventually develop large colas, almost on par with the big top one. 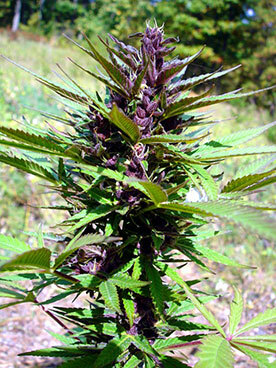 The buds of Purple Power are purple in color and fairly frosty, and as this beauty matures, they turn darker almost to the point of looking black. Beside its very appealing looks, Purple Powers is also a very pleasantly smelling cannabis strain, so growers can expect a sweet smell while growing it. The sweet smell of a growing Purple Power is very much present when it’s dried, cured and consumed, and the taste is also very sweet, with some skunk and spice in there for good measure. Purple Power delivers a powerful high, very fast, almost guaranteed to catch you off guard, with an uplifted feeling but also a bit trippy, so you should always make sure you don’t overdo it. The high will after some time spread to the body and induce a very relaxed and mellow state. All around, this is a great strain to use during any time of the day, as long as you remember that a toke or a few too much will leave you tripping. Purple Power is a cannabis strain that’s easy to grow, as long as you don’t grow it inside, because if you try, there’s really no telling what this unreliable beauty could do. On the outside, however, it’s not unreliable at all – it will grow effortlessly, a true joy to witness, and it will do so even in colder climates up north. For the biggest yields it would be best to grow this powerful cannabis strain in warmer climates, but then again, the yields you get in the north will be more than just fine. There’s no lack of seed shops, grow shops and seed banks where you can buy Purple Power seeds online, you only need to look around on the internet to find them.